A lot of you all know that the west coast is killing it right now when it comes to that sound from L.A. that you can’t quite describe, but you can pretty much bet its going to be on point. Well, just in case you didn’t know, then check for Flying Lotus, Samiyam, Nobody, Gaslamp Killer, Daedelus, (to name a few) and the man of the hour, Ras G, all very well known for their appearances at the weekly, no holds barred, beat showcase, Low End Theory in Los Angeles. 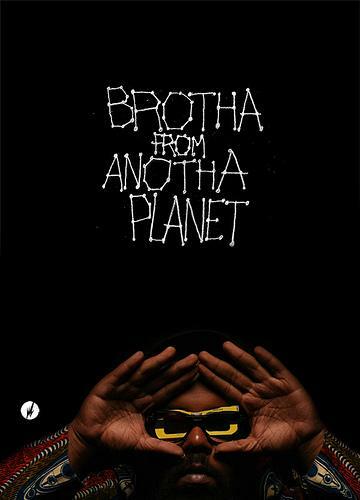 After a handful of EPs and a recently dropped joint, Ghetto Sci-Fi (Poobah Records), we get yet another full release: Brotha From Anotha Planet on Flylo’s Brainfeeder imprint. Ras G’s music cannot be easily described..you would most likely need an extraterrestrial being to translate some of the sounds he manages to construct/deconstruct..but definitely in a good way. At first listen you begin to hear influences of the unpredictable free jazz styles (though not a jazz album) of Sun Ra, Coltrane, and Horace Tapscott, the heavy, in the red, Dub bass drops of King Tubby, and undoubtedly the dustiest, dirtiest drums of hip hop peers J Dilla, and label mate Flying Lotus. Add randomly scattered static, scratches, vocal samples from various films and records, crazy left and right pans (especially if you listen through headphones) and you are ready for some serious space traveling. Along with keeping an original and progressive presence as a pioneer in the Los Angeles music scene and worldwide, Ras is genuinely a cool cat, giving even more reason to support his music. On that note, be sure to check for previous releases on his Myspace page and pick them up. What I dig most about the album is how he creates abstract and astral landscapes that tie the tracks together, some even without drums, making it much more than a beat tape, as many hip hop instrumental albums have been categorized. Keep your mind open and you will indeed appreciate this cat’s contributions to hip hop music. Astrohood – Sun Ra Arkestra intro, bouncy drums, trademark air horn, a “signature” track (imop). Come Down (2 Earth) – One of the more straight forward tracks on the album, spacey head nod joint, with a couple of throwback samples. Alkebulan – Hands down my favorite joint. I’m sure the bboys are tearing this one up..and be SURE to check for this video on his myspace page, definitely one of the dopest. Junior Star gives Brotha From Anotha Planet a 6 out of 7 head nods.